Two additional ConserVentures supporters, retired military men Mike McCarthy and Bill Meilahn, assisted during the workshop. They proved adept at laying confusing poacher-like tracks and, in Bill’s case, playing the part of a murder victim for the section on securing a crime scene. During off hours the four went out with the researchers based at the center to look for some of the 40-plus lions now under study in the area. The growing population represents an astounding success story for the conservation efforts underway in the Olkirimatian and Shompole Maasai communities. Familiar as they are with big wildlife in their home parks, the team found it enervating to sit in the open bed of a Land Cruiser pickup surrounded by seven or eight members of a local pride just as dusk descended on the bush. Evening found us all round a fire, listening as watching as the Maasai, born storytellers, made up on the spot songs of the day’s events and skewered various participants both black and white, to the hilarity of all (see our Video page for clips). By the third night the two groups of rangers had also delved deep into philosophical discussions on the future of conservation and wildlife in both Africa and America. A nyama choma (meat feast) of roast goat celebrated the end of the workshop, but by no means the end of our continuing partnership with the South Rift Game Scouts, dedicated men on the front line of conservation in the vast game-rich Maasai country between Amboseli National Park and the Maasai Mara National Preserve. 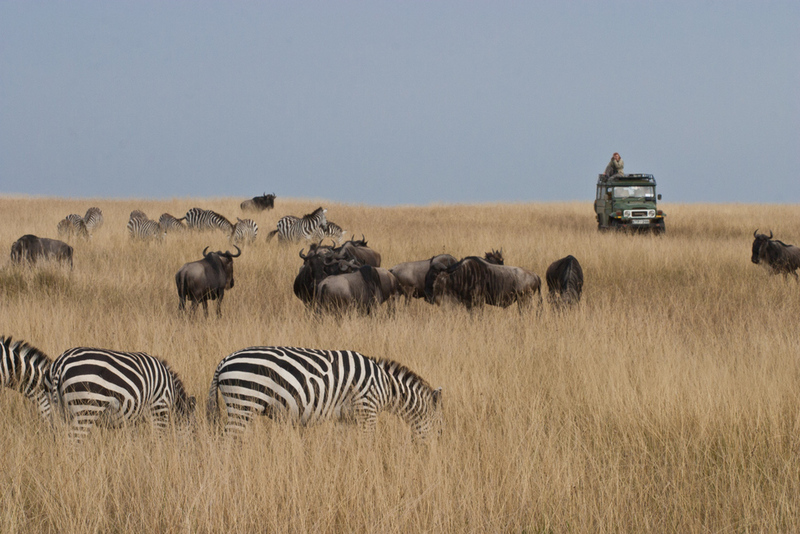 After the workshop was finished, we led the group on a safari that essentially circumnavigated the entire Serengeti ecosystem, a 12,000-square-mile expanse of the finest wildlife habitat in East Africa. In two Land Rover 110s from Shaw Safaris, each equipped with the willing yet frugal 300Tdi engine, we began with a climb up the Nguruman Escarpment—the precipitous west wall of the Rift Valley—on a road inaccessible without prior arrangement with the local Maasai community and Philip Leakey, former Minister of Parliament in Kenya and son of the anthropologist Leakeys, who owns a chunk of land there and supervises a bustling workshop that employs nearly one thousand people making crafts that are sold around the world. From the Talek Gate at the Mara a long dirt road takes one north and then west toward the Kenya/Tanzania border crossing at Isebania. Once through the ubiquitous African border insanity another hour on smooth tarmac reveals the sun sinking over an impossibly vast inland sea: Lake Victoria, correctly if impetuously guessed at by John Hanning Speke as the source of the Nile when he reached (and christened) it not far from here in 1858 after leaving the delirious Richard Francis Burton in the care of their bearers. We’d hoped to stay at a place we knew right on the shore, but it was full (no reservations taken), so we made do with a comfortable and cheap African businessmen’s hotel for this transit night. Next morning we took the west road into the Serengeti, and relaxed for the night at Ikoma Bush Lodge, a large but well-organized tented camp set amid rich acacia thornscrub. Just outside one of our tents, a male hornbill made repeated visits to feed his mate in her nest cavity in a tree, which the pair walls up while she broods so that only a tiny (defensible) hole remains. While we sipped nightcaps under a near-full moon, hyenas whooped just off in the bush, and lions coughed and grunted a bit farther on. If you think large cats represent a danger in Africa, you haven’t met the large Land Cruisers driven by Serengeti camp guides. The main road south through the park would make 14-year-old masters of Grand Theft Auto cringe, as extended-body Troopies looking like queen termites blast past either way, often 20 degrees sideways as their rear suspensions hammer over the corrugations. We escaped with our poor little 110s unscathed, took a right turn outside the park gates, and unwound for two nights at the historic Ndutu Safari Lodge, built in the 1960s by professional hunter George Dove (best known for his trophy waxed mustaches). Here, far from the regular game-viewing routes, we had the place to ourselves and wandered near and far under the tutelage of our camp guide Mirando. We followed a leopard for ten minutes as it strolled through the early morning light, and spent another ten watching a female cheetah cruise the swamp for reedbuck with which to feed her cubs. Sadly, this trip allowed no time for a detour into the vast wildlife netherworld of Ngorongoro Crater, but our route at least skirted the rim so we could gaze in awe over the 100-square-mile expanse of the floor 2,000 feet below. We plunged off the rim’s 8,000-foot crest, down past Lake Manyara, and fetched up at one of the most classic tented camps in Tanzania, Whistling Thorn, just outside Tarangire National Park. (Full disclosure: the camp is owned by our friend Hagai Kissila, a Maasai who rescued us from a crooked guide on a Tanzanian safari years ago for nothing but thanks. ‘Nuther story.) Whistling Thorn is as close as you can get to a Hemingway/Ruark/Granger safari camp: There’s no running water, but each morning at dawn an askari brings hot water to pour into the canvas basin outside one’s tent, and a wood fire heats more water for showers at any time desired. Flush toilets add just the right amount of mod-cons and, in a bow to the multiple electronic umbilicals most of us now carry, a generator supplies evening electricity to a central charging station. With two nights to spend there, we indulged in a rental of an open-topped Land Cruiser to spend a full day exploring a mere corner of Tarangire and its 3,000 elephants, one of the largest populations in Africa. Our luck peaked with a close view of a newborn elephant just hours old, and a slightly more distant view of a magnificent black-maned lion. As always, there was much, much more to see, but we were out of time. So we headed east through Arusha, the de facto safari capital of Tanzania, where Land Cruiser Troopies and pickups are as common as Corollas. Farther on, at the border of Arusha National Park, we brought the Land Rovers home to Twiga Lodge, the Blixen-esque two-story home of Paul and Erica Sweet of Shaw Safaris. Over Serengeti and Kilimanjaro lagers we reminisced on 14 days full of hard work, close comradeship, magnificent scenery, and edenesque wildlife. We all agreed that our time with the South Rift Game Scouts had been the most rewarding part, and had made the subsequent 1,000-mile safari through the best of East Africa all the more satisfying. If you are interested in joining ConserVentures as a volunteer on our 2012 workshops in Kenya, Tanzania, and elsewhere, please fill out our Skills Questionnaire application. Naomi (right) with her mother and aunt.At Whistling Thorn Camp at Tarangire, which is a community-based project benefitting about 100 local Maasai families, we met Naomi and her family. Since the beginning, owner Hagai Kissila has supported at any one time school fees for at least 3 and as many as 5 students—mostly girls, who rarely get a chance at education here. Naomi, 15, is just finishing primary school and has posted such good grades she has been accepted to high school. Her prospects for a good job and helping to elevate her family from poverty are excellent, thanks to the funds tourism brings in (and are diverted back to the community by Mr. Kissila). Recently the community has asked Whistling Thorn Camp to help raise $6,000 to build their own school, so students there do not need to travel so far for their own education. ConserVentures is helping with this; please consider a donation today.